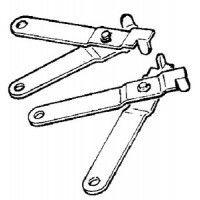 1/4 x 1/2 pivot 40 series A: 1/4"B: 1/2"C: 1/2"D: 17/64"E: 15/16"Cable: 4300..
Cable clip dual station Description: Double Cable (Parallel)Cable: 3300..
Terminal eye Pin Size: 5/16"Cable: 3300Length: 1"Material: Nylon..
Ball joints 30 series 15/16 Stud: 9/16"Thread: 1/4-28Cable: 3300..
Ball joints 30 series quick re Stud: 7/16"Thread: 10-32Cable: 3300..
Ball joint 30 series quick rel Stud: 7/8"Thread: 5/16-24Cable: 3300..
3300 ball joint Stud: 9/16"Thread: 10-32Cable: 3300..
Cable clip assy 30 series Description: Single CableCable: 3300..
Cable hook clip Description: Single CableCable: 3300..
For use with 3300 and 3300HP cable. Quick installation and maximum adjustment at engine. Includes th..
Terminal Pin Size: 5/16"Cable: 4300Length: 1"Material: Aluminum..
Quick release ball joint 40 se Stud: 9/16"Thread: 1/4-28Cable: 4300..
Ball joint 40 series quick rel Stud: 7/8"Thread: 5/16-24Cable: 4300..
4300 ball joint Stud: 9/16"Thread: 1/4-28Cable: 4300..
6400 ball joint Stud: 11/16"Thread: 5/16-24Cable: 6400.. Description: ClampCenter: 3/8"Cable: 3300Width: 1".. 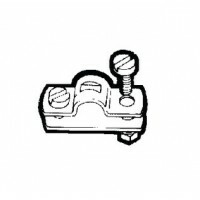 Description: ClampCenter: 7/8"Cable: 3300Width: 1/2".. Description: ClampCenter: 1/2"Cable: 4300Width: 1".. Description: Clamp & ShimCenter: 7/8"Cable: 3300Width: 1/2".. Description: Clamp & ShimCenter: 1/2"Cable: 4300Width: 1".. Fit levers with thicknesses and holes given. Description: Jaw Width: 11/32", Pin: 5/16"Cable: 3300.. Fit levers with thicknesses and holes given. Description: Jaw Width: 3/16", Pin: 3/16"Cable: 3300.. Fit levers with thicknesses and holes given. Description: Jaw Width: 9/32", Pin: 1/4"Cable: 3300.. 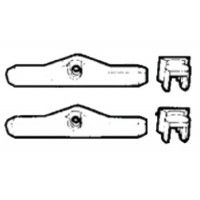 Fit levers with thicknesses and holes given. 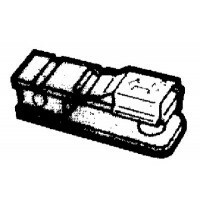 Description: Jaw Width: 9/32", Pin: 1/4"Cable: 4300..
For 3300/33C style cables Description: Mercury/Mariner..
For 3300/33C style cables Description: OMC/Johnson/Evinrude - 1979 On..
For 3300/33C style cables Description: Mercruiser Adapter Kit..
Morse pivot-30 series A: 5/16B: 7/16C: 3/8D: 7/16E: 1"Cable: 3300..
Morse pivot-40 series A: 1/4"B: 1/2"C: 1/2"D: 13/64"E: 7/8"Cable: 4300.. 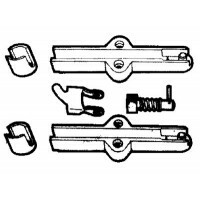 Kit adapts 33C or 33C supreme for use with Evinrude/Johnson 55-235HP 1978 to 1985, 20HP and up in 19..
Pivot 30 ser 1/4 dia A: 1/4"B: 7/16C: 21/64"D: 9/64E: 5/8"Cable: 3300..
Pivot 30 series 1/4 dia A: 1/4"B: 7/16C: 3/8"D: .316E: 15/16"Cable: 3300..
Pivot 30 series A: 1/4"B: 7/16C: 21/64"D: .295E: 23/32"Cable: 3300..
Pivot 30 series A: 5/16"B: 7/16"C: 3/8"D: 13/32"E: 1-1/16"Cable: 3300..
Pivot 40 series A: 1/4"B: 1/2"C: 7/16"D: 9/64"E: 3/4"Cable: 4300..
Brass. Heavy duty. Fits Teleflex Morse and other control cables with 10-32 ends. 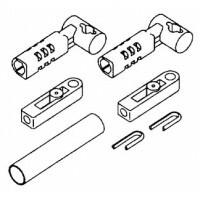 Kit contains 2 each..
Pivots 30 series 1/4'dia A: 1/4"B: 7/16C: 3/8"D: .191E: 23/32"Cable: 3300.. Description: ShimCenter: 1"Cable: 3300Width: 1/2".. Description: ShimCenter: 7/8"Cable: 3300Width: 1/2"..
Morse stop collar A: 3/8"B: 3/8"C: 8-32D: 3/32"Cable: 3300.. Contains terminal eye pin, E-ring, nut and washer. 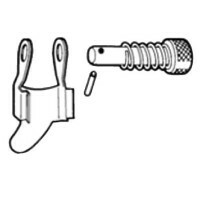 Cable: 3300..
Includes all pivots, ball joints and other special hardware required to assemble a clutch or throttl..
Includes (2) CA-37701 ball joints & (2) 031419 brackets. Cable: 3300.. Fits C2, C8, MACHZero and all 33C style cables. 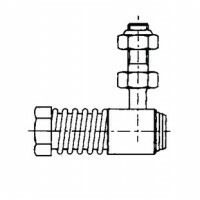 Description: Ball joint 10-32, Stainless Steel.. Fits C2, C8, MACHZero and all 33C style cables. Description: Cable Clamp.. Fits C2, C8, MACHZero and all 33C style cables. 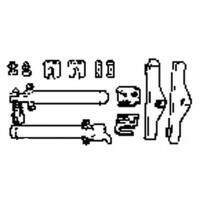 Description: Clevis 10-32..
Connect kit/c14 cable to engn Description: Kit to connect C14 OMC to B89/90 control..
Fitting kit for b47 & b49 Description: Kit to connect C14, MACH14 and OMC® type "OS" cables.. Kit to conn c4 to b47-49 Description: Kit to connect C4 and OMC® type "O" cables to B47 and B49 con.. 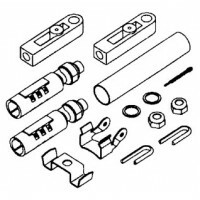 Connection kit Description: Kit to connect C2, C8, MACHZero and all 33C style cables to B47 and B49 ..
Connector kit for b83/b84 Description: Kit to connect C5 and MC5 Mercury Gen I cables to all Uflex c..
Ratchet kit Description: Adjustable ratchet for B203, B204, B207, B208, B217, B218, B219, and B220 c..
Adaptor kit for merc w/c2/c8/ Description: Adapts C2, C8, MACHZero and all 33C style cables for use .. Kit to adapt c Description: Adapts C2, C8, MachZero and all 33C style cables for use with Johnson®/E..